Dark Horse: True Grit and what an upset that would be. Oscar ballot: This one is tough, but I'm going with David Fincher since The King's Speech will probably take Picture; this will be Social Network's consolation prize. Dark horse: James Franco who's brilliant and equally as deserving. It's hard to hold a movie alone, just ask Tom Hanks. Who probably should win: Ryan Gosling...but once again this category sucked so, I'll say Javier Bardem. I'd like to see anyone else do what he did in Biutiful. Who should win: Annette Bening, long overdue but always the Oscar bridesmaid, never the bride. Who probably should win: Natalie Portman. Oscar ballot: Christian Bale. Hands down showing the world what a versatile and amazing actor he is in The Fighter. Oscar ballot: Hailee....no, erm, Meli.. ahhh! such a tough one! okay fine: Melissa Leo (Tough category). Dark Horse: Jacki Weaver, I've heard great things of this movie, and I 've heard she's one of the highlights. I'm not really sure about any of the other ones, honestly. I don't quite understand why the Coens got this nomination as I hear that the movie is verbatim of the novel. I could be wrong. I'm going with Aaron Sorkin all the way. Who probably should win: The Illusionist. This movie epitomizes what it is to be an animated movie through and through. I love Toy Story 3 and How To Train Your Dragon in an emotional way, but if we're looking at quality and excellence in this category, politics aside, The Illusionist wins through and through. Oscar ballot: The King's Speech. I'm only putting this in here because this is so dumb it will win it. Who probably should win: True Grit. Damn, I felt like I was in that nasty part of Texas they call El Paso (which is near where they filmed the movie). Dark Horse: Alice In Wonderland. Atrociously boring movie that looked awesome. Oscar ballot: True Grit. Long time cinematographer for the Coens, Roger Deakin, needs some love, which is part of the "politics" part of the Oscars I can't stand. Who probably should win: Black Swan The movie moved seamlessly between beautiful dance scenes to intimate and disturbing contemplating moments that made you feel almost as crazy as Natalie Portman did in the movie. What would be fun: The Tempest, especially since I heard it was awful. What probably should win: True Grit. Dark Horse: Alice In Wonderland. What I'm really cheering for: Exit through the Gift Shop because I want to see what crazy antics Banksy thought up! I honestly didn't watch that many documentaries this year. Oscar ballot: ummmmmmm, Killing in the Name? Sure. Oscar ballot: Trent Reznor and Atticus Ross-Not only is the 12 year old in me freaking out, but this was one of the best scores and pieces of music this last year. Oscar ballot: "Coming Home" because everyone is a little bit country. What my musical fan-girldom really wants: "I See the Light" Love me some old-school Disney movies. Why there was no Daft Punk(Tron: Legacy) or Beck(Scott Pilgrim vs. The World) is beyond me. There were great songs in both of those movies. I guess they're still stuck in their old lite rock FM radio choice of songs for this category. Oscar ballot: Day and Night, absolutely precious, plus, I mean, it IS Pixar. I didn't get a chance to see the animated ones. So I'm going with the easy one. Oscar ballot: Inception because it needs some love. 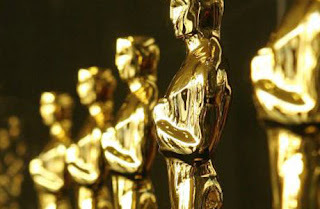 Oscar ballot: The King's Speech -another category that the Oscar bait will win.